Max-Air Technology Heavy Duty Series (HD) Scotch Yoke Actuators are available in two distinct configurations: SHD (symmetric) and CHD (canted) heavy duty selectable torque profiles are designed to perform in the most demanding applications based on valve requirement. Engineered to pneumatically automate all types of quarter turn valves (ball, butterfly, plug, damper), where reliably high torque outputs are necessary. Double Acting 13,367 to 2,738,990 in-lbs, Spring Return 5,328 to 1,320,215 in-lbs. Please refer to torque charts for specific details. SHD (symmetric type) and CHD (canted type) heavy duty scotch yoke actuators are designed to perform in the most demanding applications. 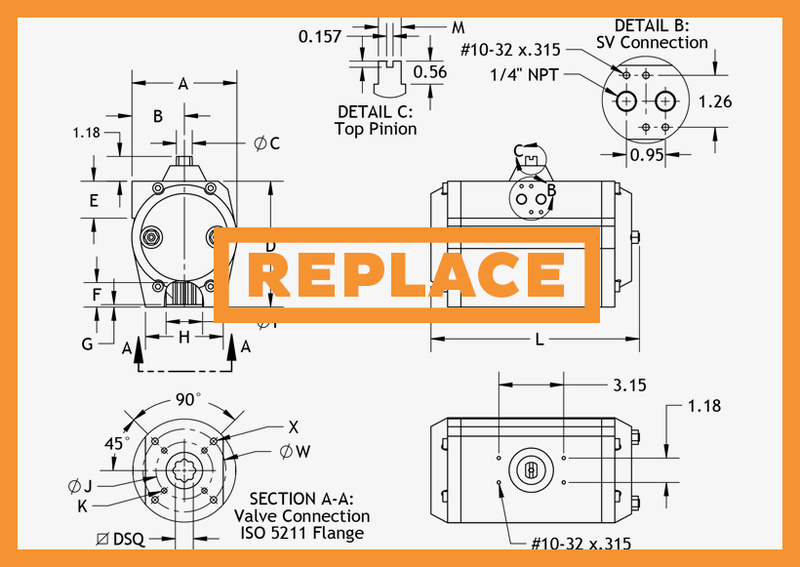 They are engineered to automate all types of quarter turn valves (ball, butterfly, plug and damper) with multiple torque profiles available in order to provide a “best fit” for every situation. The slide block has a wide surface contact area, impregnated with PTFE, which assures lower contact forces and smoother operation and is designed to withstand higher forces through load distribution, thereby protecting process critical equipment. The SHD and SHD actuators are all provided with bidirectional travel stops to allow for open and closed position location adjustments of +/- 6 degrees. Both series have a bottom interface in accordance with the ISO 5211 standard. This helps provide for easy valve to actuator connection. The top-works dimensions, both for shaft height and mounting pattern are according to NAMUR standards allowing for easy and standard accessory attachment. The internal wall of the cylinder is hard chrome plated in order to maximize wear and corrosion resistance. Provides maximized operational flexibility in selection and combination of power cylinder, body and spring pack, and dampening systems depending on project requirement. Allows the SHD and CHD series to be suitable for installation both indoors and outside. They can be custom fitted for both high and low temperature applications by changing the seals and lubricants to suit the application. Both the guide rod and piston rod are plated with hard chrome to provide a high level of wear resistance. All SHD and CHD series units are permanently lubricated with materials and lubricants appropriate for the service conditions. No maintenance is required in normal service. In addition to assembling these actuators with a long life grease, all bearings in high load areas have been constructed with dry lubricant materials which are impregnated into the load bearing surfaces. This enables the unit to transfer the maximum possible load through the unit to the valve stem resulting in an extremely efficient actuator. The precompressed spring pack minimizes transverse load on the piston rod thereby increasing the durability and service life of the actuator. A three layer epoxy coating is applied to every SHD and CHD actuator in order to provide maximum protection against environmental corrosion.